By the time you spot the tree ahead, it’s already too late. People around you shout warnings, but they’re too far off and you can’t really hear them. I’m speaking from experience: as a child and as an adult, I had life-threatening anorexia. It started small – but before I knew it, it had stripped me of everything. Even while I was killing myself, it felt like life. Anorexia doesn’t happen overnight. It’s often slow, insidious and imperceptible. However, once started, it’s like a juggernaut, gaining its own relentless momentum. One of my friends has a black Labrador, and we used to take him for walks in the park. Sometimes we’d throw the ball and he would run down the hill after it. He’d start off at a gentle pace but, as the incline grew steeper, he would be forced to gather speed. Bewildered, he was unable to stop, no matter how hard he tried. He would overshoot the ball and come crashing to a standstill, usually aided by a tree. We would bandage him up, but next week he would do the same thing again. Eating disorders can be similar. You start with an achievable aim in mind. Maybe to ‘just lose a few pounds’. Or ‘fit into that skirt, in time for the wedding’. You set off at a gentle canter. But as the goal approaches, you gather speed. You’re racing past the initial target, but at first it doesn’t matter. The big day passes and you’re high on compliments. The skirt’s too big, but you can’t stop now – your adrenalin is pumping and you’re moving faster and faster. The world starts to become a bit of a blur. You’re lost in the chase. By the time you spot the tree ahead, it’s already too late. People around you shout warnings, but they’re too far off and you can’t really hear them. What started as a game has become something darker, and you can’t stop, even if you want to. Your body is a rocket, propelling itself forwards. If you will crash is no longer in question. It’s whether or not you’ll get back up. Nor is anorexia just a problem for those outside the church. When I was at my lowest point, I was a student at Bible college. I led a thriving Sunday school. I’d been married for four years to a church minister in training. We were seen as ministry dynamos, a couple who would go far. Nonetheless, I was slowly but surely killing myself. And unless the Lord had stepped in, that’s exactly what would have happened. Watch a video of Emma at our [email protected] Momentum event, filmed in August 2012: We found God in a hopeless place. 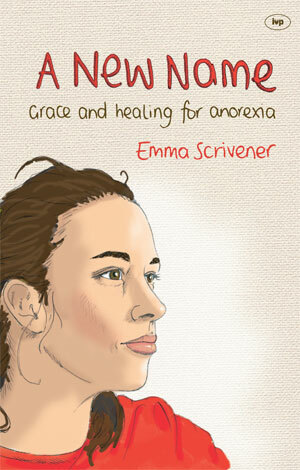 Emma grew up in Belfast and suffered from life-threatening anorexia as a child and as an adult. She now speaks and writes about her experiences at www.emmascrivener.net. Her book, ‘A New Name’ is published by IVP on 20.7.12, (ISBN: 9781844745869, 176 pages, £7.99). It can be ordered at the website above or from IVP Books.